Introducing the 154 monsters of Tuxemon Set 1! Here are the 154 monsters we have created for Tuxemon Set 1. There's room for some additions at the end of the numbering, if we complete some more before we officially launch Set 1. 4. Post elsewhere? On DeviantArt? 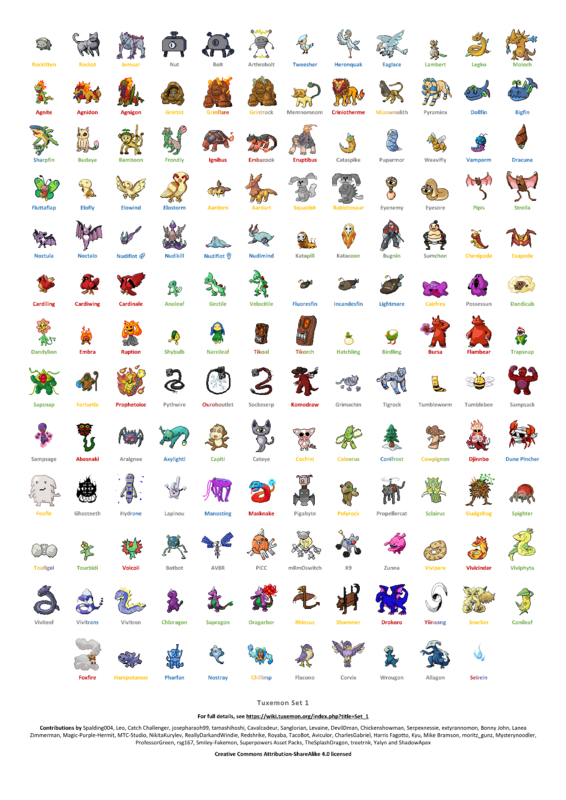 Do people know of an easy way to collect all 154 front sprites onto one graphic, with nice borders and stuff? Would be good for posting on DeviantArt, etc. What other thoughts do people have? I think this could be a great recruitment tool for the project, and I think this pool of assets is a significant contribution for other open source projects as well. That sounds great! I may be able to get a custom splatoon splatfest based on two Tuxemon if you are interested in that. However, it would help if we could get Tuxemon working on the Wii U before that. Or grab a printable A3 poster. That poster does highlight the vast range of quality in the sprites though. I actually like to see that in a community project - shows that everyone feels welcome to participate. But there's definitely room for people to put forward alternative sprites as well. This is awesome! I really the the poster! It would be so cool to have a large print of it. I've put Set 1 up on Open Game Art and have promoted it in a few places. Please promote it anywhere you think people would find it useful.